No need to source them, if you live in central Ohio and aren’t obsessive about weeding your lawn, you’ve probably got them snuggling in shady spots. They are a most remarkable addition to a salad. The ones in my backyard had a lovely green flavor: a cross between a pea and lettuce and leave, as you might expect, a subtle floral note. They are quite plentiful this time of year (at least in my yard), and are sweetest in the spring and less so as it gets hotter, so don’t be afraid to use them now. 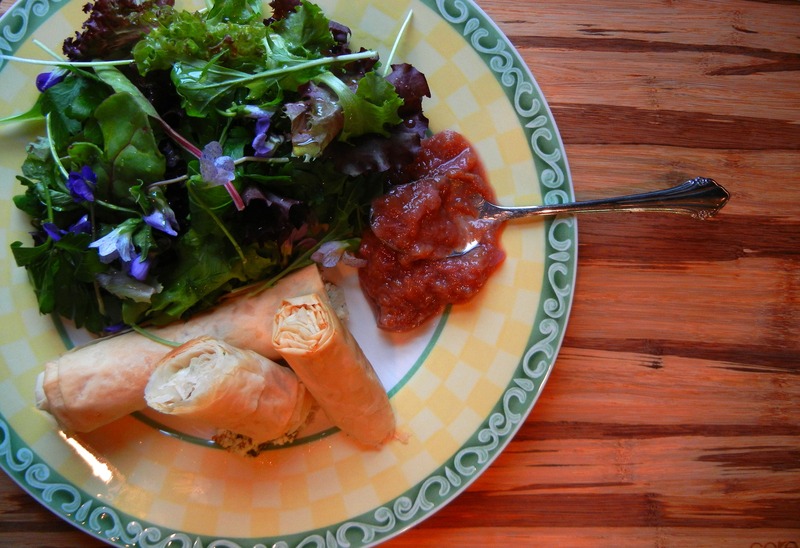 I paired this floral salad with herbed goat cheese rolled in buttered phyllo sheets. Goat cheese mixed with a little salt and pepper and chopped fresh herbs (dill, parsley, thyme) makes a great filling for crispy phyllo. Four ounces will fill eight sheets of phyllo, and will bake to a golden crisp in about 30 minutes. To assemble, I took a sheet of phyllo and laid a rolled piece of the herb cheese mixture in the center on one end. Use a heaping teaspoon and pretend it’s playdoh; roll it out to a third of the width of the sheet. Brush the phyllo with melted butter and fold the sheet in thirds length-wise to cover the cheese. Roll up the dough loosely into a cigar shape and brush again with butter. Place on a parchment lined baking sheet and bake for about 25 to 30 minutes in a 350 degree oven. You know what’s perfect with olive oil dressed violet flowers and these phyllo and goat cheese crisps? The rhubarb jam that was left over from the Rhubarb Middleton from earlier in the week. Sometimes, there is serendipity in the kitchen. Spring is here. Playlist included Changing, by The Airborne Toxic Event. PK Tip – Make sure you carefully identify your flowers, and make sure they aren’t covered in pesticides or fertilizers. Use common sense! 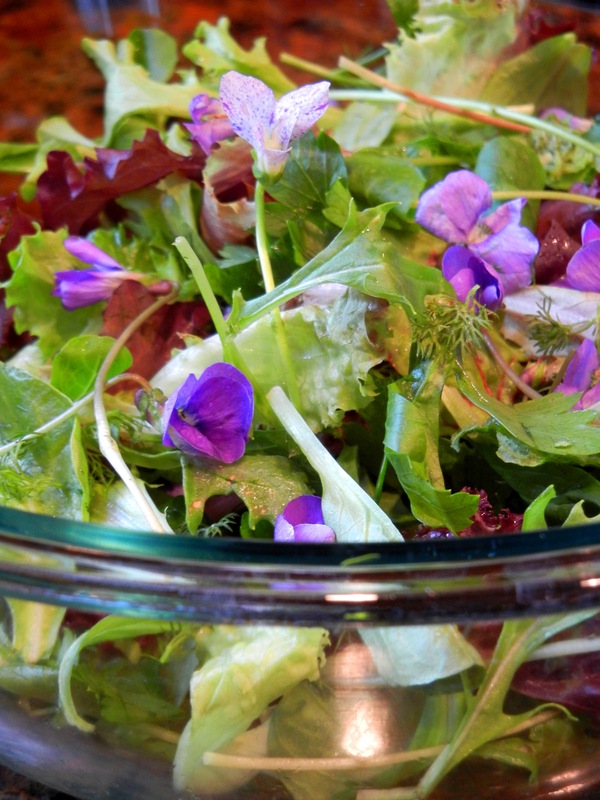 Not sure I’ve ever seen those violet flowers in Texas, but what a wonderful (and tasty) idea to add to your salad. Even better that they just randomly grow in your backyard. The goat cheese in phyllo looks really good too. We’ve never cooked with phyllo before, but I’m adding it to our to-make list! Great post. That looks fantastic. I’m about to pull the first of my arugula and can’t wait. Oh arugula. How divine. Fantastic stuff. So bitter, so versatile, so delicious! My violets are just starting to bloom now. I can’t wait to add them to a salad. They are also a beautiful addition to the top of a cupcake. I want to sugar some and put them on everything. I want to float them in a cocktail! I love these little harbingers of spring!